Regular Meeting - Graeme Priddle, "Surface, Surface"
New Zealand turner Graeme Priddle, straight from the AAW National Symposium in Portland, will demonstrate coloring, inlays and finishing techniques in a special appearance at OPCAAW's June meeting. Priddle has over 20 years experience in the woodworking field and is internationally known for his sculptural turnings/carvings that reflect his life and environments in Northland, New Zealand. He has won numerous awards for his work, which has been exhibited widely in New Zealand, UK, Japan, Taiwan, France, Germany, U.S. and Canada. This will be a great opportunity for members who were unable to attend the national symposium to see a demonstration from one of the world's noted turners. The meeting will also feature Show and Tell and the wood auction. 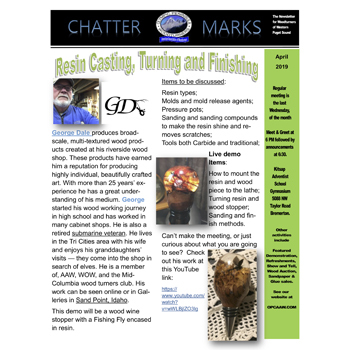 Members will have access to our library and to sandpaper and CA glue sales.